Just a quick post to share my newly developed buttermilk bread recipe with you. I had a purposeless tub of buttermilk sitting in the fridge and didn’t really fancy baking any of the usual options like scones or soda bread. So, I decided to make a buttermilk-based sourdough loaf, using predominantly white bread flour, but providing depth of flavour and taste by adding dark wholemeal rye flour. The resulting loaf tasted delicious (and has been baked five times since), so do give this a try if you like the sound of a buttermilk sourdough bread. Buttermilk is traditionally a by-product of butter-making – the liquid that is left over after butter is churned from cream. However, what we find in supermarkets nowadays is often made by adding an active bacterial culture to skimmed milk. These cultures convert some of the sugar in the milk (the lactose) into lactic acid which causes the milk to thicken. When used in bread making, buttermilk adds a pleasing tang and tartness and makes the crumb more tender. You’ll also find that the dough has a soft and creamy quality while kneading. I always use organic ingredients for cooking and baking and although it is not readily available in supermarkets, organic buttermilk can be found in the UK. Daylesford Farm offers the real deal. Creamy and tangy organic buttermilk, made in the traditional way as a byproduct of the butter they produce. I used only a small proportion of dark rye flour in my recipe as buttermilk tends to work best with mild flours in order for the tangy flavours to come through and the crumb to remain soft. 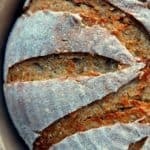 Add herbs or spices to this buttermilk sourdough bread to play with different flavour combinations. 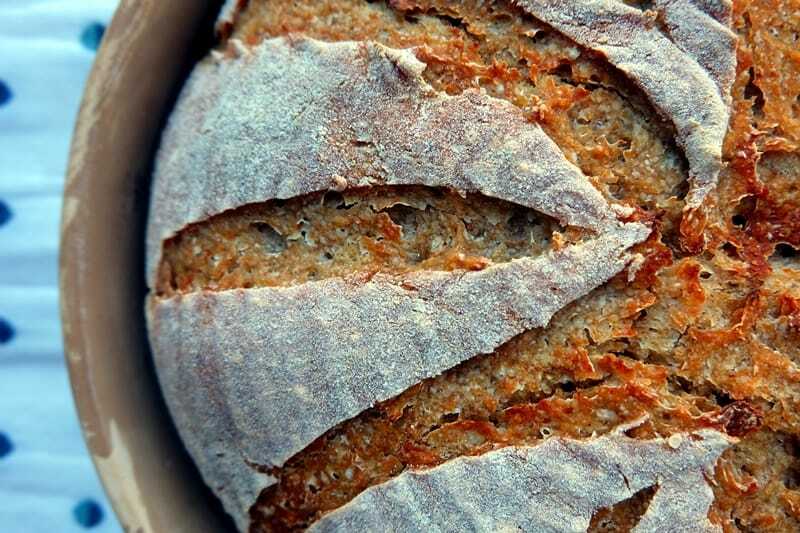 An easy recipe for a wholesome loaf of sourdough bread. I love using buttermilk in sweet baking and it's a beautiful ingredient for sourdough loaves too. 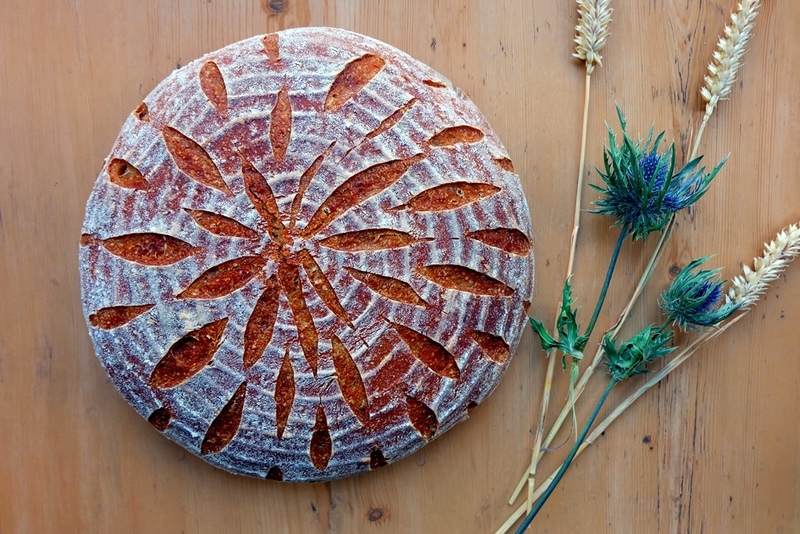 On day 1, prepare the sourdough by combining the sourdough starter, wholemeal rye flour and water in a medium bowl. Mix well, then cover and leave to rest for 16 -24 hours at room temperature. On day 2, once the sourdough starter is ready, combine 260g of the refreshed sourdough (the rest goes back into the fridge for your next bake), the strong white wheat flour and wholemeal rye flour, the buttermilk (ideally at room temperature), the water and salt in a large bowl. Combine to form a dough, then turn it out onto your work surface. Place the dough back into the bowl, cover and leave to rest for 30 minutes. Turn out the dough and knead for 1 minute. Place back into the bowl again, cover and leave to rest for a further 30 minutes. Turn out the dough and shape into a boule. Bathe the boule in a flour bath so it's no longer sticky on the outside, then place seam-side up into a pre-floured proofing basket. Proof for several hours until risen - it takes about 3 hours in my kitchen but as always the proofing time depends very much on the temperature in your room so it might take a little shorter or longer - then preheat the oven to 200°C, and - if using - your baking dome at the same time. Turn out the fully proofed loaf onto the preheated baking dome plate (if using) or a baking tray lined with baking paper. Make several decorative slashes with a scoring knife. Put the cover on the baking dome plate (if using). Bake for 15 mins at 200°C, then turn the temperature down to 180°C and bake for a further 40 mins. Take off the baking dome cover for the last 10 minutes to finish the crust.